Mangrove forests line virtually every undeveloped piece of shoreline in the Pine Island area. Where there are no mangroves, people are usually the reason. There are three types of mangrove trees in our area, each with there own uniqueness. The Red Mangrove is the first of the mangroves to conquer new territory. Its ten-inch long seedlings are dropped from the main tree to the base of its parent. At low tide it will spear the soft mud and begin growing a new root system. If the tide is in, the seedling will fall into the water where it is carried by the currents to a new frontier low tidal spot, which could be nothing more than a small barely visible sandbar or the shores of the mainland. The red mangrove seedling will then begin to spread its anchoring roots within hours. With each rise and fall of the tide the seedling will anchor itself further into the sediment until it has a firm grip. Soon leaves will appear and if the seedling has been able to hang on in spite of the rising and falling tides it will send out an umbrella of root shoots that will go outward and downward into the sediment which will make the seedling a permanent fixture. This same root system gathers the nutrients from the water as well as filtering out the fresh water from the salt water. As time goes on the roots grow thicker and taller causing the main tree to actually rise a foot or more above the water level. It creates a barrier, which prevents ground beneath it from being pummeled by the currents and waves. As it retains sediment the land area around it becomes stable and suitable for other land based trees and animals to grow. Mangrove forests are the most common place for Pelicans, Cormorants, Egrets, Anhinga and other waterfowl to nest safely away from predators. They create an excellent habitat for oysters, sea squirts, crabs, snails and other marine life. In the evenings at a low tide, Raccoons feed on oysters that cling to the mangrove roots. As the land level rises and becomes more like a true island, it becomes less suitable for Red Mangroves. Although the Reds will continue to develop on the edge, the Black Mangroves take over on filling in behind the Red followed by White Mangroves, Buttonwood (not a true mangrove) and eventually the Hardwood trees. Often times the unplanted spaces that are left between neighboring mangrove forests become the path of least resistance for incoming and outgoing tides creating a tidal creek with a depth too deep and a current too swift for the Mangrove shoots to take root. 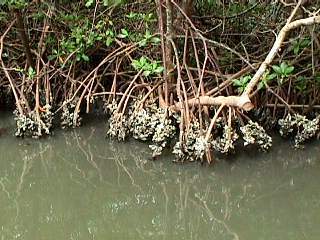 This explains the many navigable canals and passage-ways common to a typical Mangrove forest.